No need for Netflix on June 27-28 — the second annual ¡Viva Cinema! 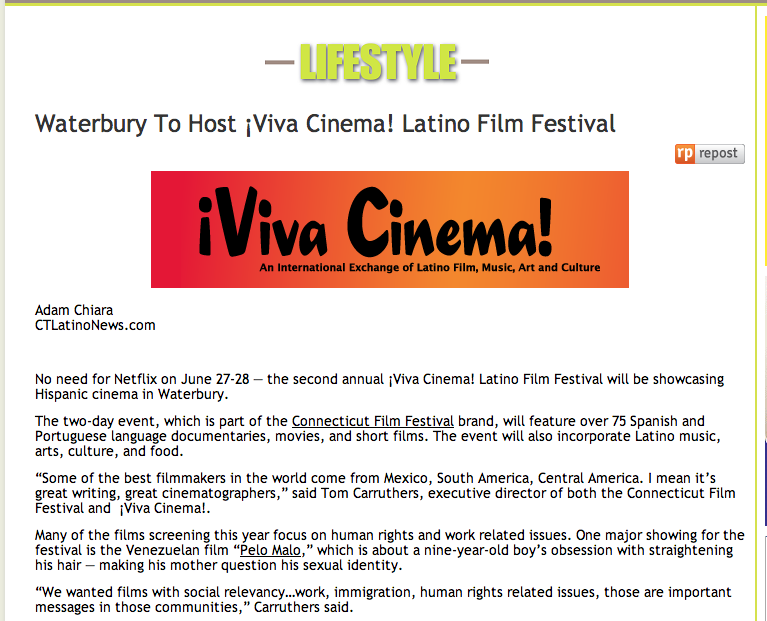 Latino Film Festival will be showcasing Hispanic cinema in Waterbury. The two-day event, which is part of the Connecticut Film Festival brand, will feature over 75 Spanish and Portuguese language documentaries, movies, and short films. The event will also incorporate Latino music, arts, culture, and food. “Some of the best filmmakers in the world come from Mexico, South America, Central America. I mean it’s great writing, great cinematographers,” said Tom Carruthers, executive director of both the Connecticut Film Festival and ¡Viva Cinema!. Many of the films screening this year focus on human rights and work related issues. One major showing for the festival is the Venezuelan film “Pelo Malo,” which is about a nine-year-old boy’s obsession with straightening his hair — making his mother question his sexual identity. “We wanted films with social relevancy…work, immigration, human rights related issues, those are important messages in those communities,” Carruthers said. He believes it is crucial that Connecticut residents have the opportunity to see Hispanic films in person and that they have a venue to discuss the movies with others. The event will also give filmmakers the chance to compete for awards in several categories, including: Best Narrative Feature, Best Documentary, and Best Short Film. Next Latino Values More Aligned With GOP?